HCM CITY— Wholesale and retail markets in HCM City are busier than ever with the Lunar New Year (Tết) holiday only weeks away. District 1’s famous Bến Thành, one of the city’s oldest markets, is seeing more than double the average number of people on normal weekends. About 3,000 stalls began preparing for the year’s biggest business season last month, stocking thousands of Vietnamese items, including food, garments, footwear and handicrafts. 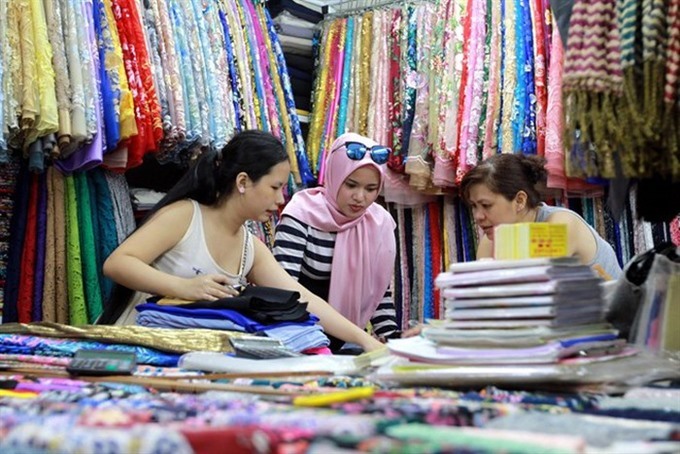 Cao Trung Tín, deputy head of the market’s managing board, said that traditional Vietnamese silk and cotton clothing, handicrafts and foodstuffs like fried seafood, which can be stored for months, are favoured by locals and tourists. “We attract more than 7,000 Vietnamese and foreign visitors a day during the month before Tết,” he said. Bến Thành market began when street vendors gathered together near the Bến Nghé River in the early 17th century. It was established by the French colonialists after they took over the Gia Định Citadel under the Nguyễn Dynasty in 1859. In 1912, the market was moved to a new building on a land of more than 13,000 square metres located on what are now the streets of Phan Bội Châu, Phan Chu Trinh and Lê Thánh Tôn. Clothes including áo dài (traditional Vietnamese long dress) made from domestic fabrics like silk and chiffon are the favourite products of foreign and local visitors. “My shop offers Vietnamese clothes from just VNĐ150,000 (US$7) to 350,000 ($16). Áo dài in traditional materials are 500,000 ($23) for females and 700,000 ($33) for males,” said Nguyễn Mai Anh, a garment shopkeeper who speaks English, Chinese and Japanese. “My customers, particularly Japanese and Korean visitors, like Vietnamese designs because they are traditional and the price is reasonable,” she said. Anh hopes that her income “will triple compared with previous months” in the run-up to Tết. In Bến Thành, customers are free to bargain but many vendors offer fixed prices. Wholesale markets Bình Tây in District 6 and Soái Kình Lâm in the Chợ Lớn (Big Market) in District 5 are also busier than usual. About 1,500 shops at the 90-year-old Bình Tây market sell a variety of quality goods, including art objects, souvenirs, clothes and traditional Vietnamese dried foodstuff and medicinal herbs. Shop owners allow their regular dealers from the provinces of the Mekong River Delta to postpone payments after Tết, which begins on February 5. “My shop offers traditional sugared products or mứt, made from kumquat, lotus, coconut, squash or sweet potato, made by farmers in southern provinces. Traders from the north and central regions began ordering early this month,” said Hoa Lâm, a Chinese-Vietnamese shop owner. His shop offers competitive prices of VNĐ120,000 (US$6)-190,000 ($10) per kilogram, which are 5-7 per cent higher than last month. Shops offering vàng mã (votive paper) are also busier as Vietnamese burn the paper items during Tết to wish departed loved ones or forsaken spirits a happy and lucky year. Rows of miniature paper replicas of consumer goods such as houses, motorbikes and other luxuries are bestsellers. Bình Tây market was built on 25,000 sq.m of land in 1928. It was designed by a French architect who mixed traditional Chinese and East Asia architectural styles. It re-opened recently after renovation, which cost of VNĐ104 billion (US$4.5 million). At Soái Kình Lâm market, 500 shops offer clothes and handmade accessories. The market has seen 3,000, or double the normal number of Vietnamese and foreign tourists, on the weekend, according to the market’s managing board. “I began my business career here when my mother turned over her business to me five years ago. Our profit has fallen by 25 per cent compared to before 2010, when there weren’t many shopping malls,” said shop owner Hồng Quang Minh, who developed his family business for 20 year at Soái Kình Lâm. Minh said Vietnamese, particularly young people, like silks imported from South Korea, China and Thailand, while foreign visitors often buy traditional Vietnamese clothes and handmade bags and shoes. Minh said that tourism development had brought more foreign customers to the market in the last few years.